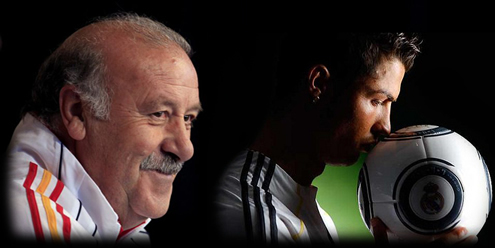 14.04.2011 » Del Bosque: "CR7 and Messi are Real Madrid and Barcelona identities"
The Spanish National Team coach, Vicente Del Bosque, said recently that Cristiano Ronaldo and Lionel Messi are respectively Real Madrid and Barcelona main figures. Del Bosque expects 4 very exciting games and doesn't believe that the "Manita" (5-0) imposed in the Camp Nou will influence Barcelona or Real Madrid's confidence levels. Vicente Del Bosque, the Spanish National Team coach, said that Cristiano Ronaldo and Lionel Messi are the true identity and main players from both Real Madrid and Barcelona. Not that such a statement can be seen as exactly breaking news, but still, the Spanish coach reafirms his believes that both CR7 and Messi will be decisive in the 4 "Clasicos" that will be played in a period of 18 days. Del Bosque: "The two star players influence and affect a lot the way both teams play. Real Madrid fast transitions and counter attacks are the brand image of Cristiano Ronaldo. In the other hand, a style that demands more passing and patience, clearly allows Messi to be identified with." The Spanish coach also made a preview for the upcoming matches between Real Madrid and Barcelona. In Vicente Del Bosque's opinion, "La Manita" (5-0) from the last "El Clasico" match, won't be very important for the next games: "That result happened almost 6 months ago and I don't believe anyone got truly affected from it. Neither Barcelona will feel more safe, or Real Madrid more insecure because of the 5-0 result in Camp Nou."